You are here: Home » Blogs & features » Print features » Rwanda: Expanding the tax bracket – how low can you go? Rwanda: Expanding the tax bracket – how low can you go? Rwanda is hoping to raise enough money through taxes so that it is no longer dependent on foreign aid. But integrating the country’s informal sector into the tax system is proving difficult, and is causing some people working in the sector to struggle with the new policies. Until last year Jean Nepomuscene Ndahimana, a street hawker in the Nyamirambo area of Kigali in Rwanda, had been able to go about his business selling socks without hassle from the police. He bought a small house in the town’s poor suburb of Rwampara for him and his family and was able to make a respectable, if simple, living. But last year the government began to enforce a trade law prohibiting street hawkers. The police began a campaign to get hawkers off the streets and Mr Ndahimana found himself in a dilemma: unable to afford a trading licence to sell his wares legally, but not prepared to give up his livelihood. So he continued to sell his socks while trying to dodge the police. He has evaded them many times. But the 30-year-olds says he has also been arrested, even temporarily locked up, and had his goods confiscated innumerable times. He ended up in debt, was forced to sell off his house and had to send his wife and two children back to his home village, while he continues to try to eke out a living and tries to stay one step ahead of the police. “President Kagame himself said that every Rwandan should create a job and this is the job I created for myself, why should I be denied to do it?” he asks while carefully setting out the various socks that he sells. A banner banning street hawking hangs close by. Mr Ndahimana’s predicament is becoming a common story in Kigali, where the government is currently trying to bring the informal sector into the tax bracket. President Paul Kagame has said he wants his government to raise enough money through taxes that Rwanda no longer has to depend on foreign aid from countries such as Britain. At the country’s eighth National Tax Day this summer, where awards such as “most compliant and exemplary taxpayer” are handed out, Mr Kagame called upon all Rwandans to stop looking at tax as a burden but rather a means of facilitating the country’s progress and economic growth. But there are many hurdles, not least the high cost of buying the necessary licences. Small-time traders like Mr Ndahimana say they cannot afford to pay. 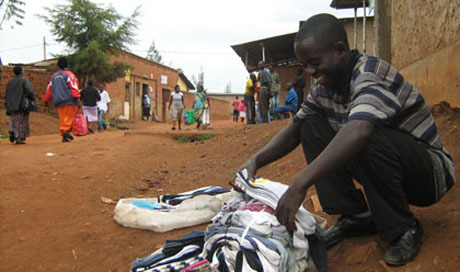 Mr Ndahimana spends around Rwf 85,000 (US$150) a month buying socks. If he sells them all he can make up to Rwf 10,000 (US$18) over two weeks. Mr Ndahimana’s determination to stay in the informal sector presents a challenge for the government. Collecting taxes in many developing countries is hard. The Rwandan Revenue Authority, which was set up in 1995, has been held up as an example of success in terms of tax collection. A three-fold increase in tax revenues between 1998 and 2006 saw the national budget also grow three-fold, from Rwf 175 billion (US$308 million) to Rwf 528 billion (US$928 million). And as tax revenues have increased the proportion of Rwanda’s budget financed by aid has declined. In 2001, only 34.62 per cent of the total budget was financed by domestic sources, while in 2008 it hit 44 per cent and is expected to rise again this year. However, Rwanda’s major remaining hurdle to strengthening its domestic revenue base is integrating the country’s informal sector. According to the Private Sector Federation (PSF), an organisation dedicated to promoting business in Rwanda, about 0.3 per cent of tax payers currently contribute 48 per cent of Rwanda’s tax revenue. There are fewer than 3,000 registered companies paying national taxes in Rwanda, according to a case study on the Rwandan Revenue Authority by the UK’s Department for International Development (DfID) and the Foreign Investment Advisory Service (FIAS). Of these, the top 13 companies are estimated to pay some 80 per cent of all taxes collected in Rwanda. Gustave Tombola, the Director of Research and Consultancy at Kigali Independent University, recently led a three-year research project into taxing small and medium businesses. He says if the government is to successfully collect tax from the informal sector it will have many hurdles to overcome. “The biggest challenge of taxing the informal sector is to locate where its businesses are working from,” he said. Mr Tombola, who defines the informal sector in Rwanda as any business with no clear accounting records, adds that the second challenge is a lack of knowledge about the tax system by informal sector workers. Because they do not always understand the system, and cannot afford to hire an accountant, they can end up paying higher taxes than they need to. The study calls on the Rwanda Revenue Authority to train small and medium enterprises on fiscal laws and visit them to explain the importance of paying taxes. In Nyamirambo market, just a few metres from where Mr Ndahimana hawks his socks, Julienne Mukarugambwa, a 56-year-old mother of six children has a different story to tell. Mrs Mukarugambwa sells vegetables from a small, one metre square space that she rents for Rwf 3,600 every month. This fee covers Rwf 2,000 as a tax for the district, while the remainder pays towards cleaning and guarding the market. With an outlay of around Rwf 15,000 (US$26) on vegetables for resale, Mrs Mukarugambwa can make a profit of Rwf 4,000 (US$7) in two days. She says that she is happy to pay tax as it is good for her country. However, more importantly, she says, it means she no longer faces any hassle from the police. The aim of the RRA is now to turn the country’s Mr Ndahimanas into Mrs Mukarugambwas.